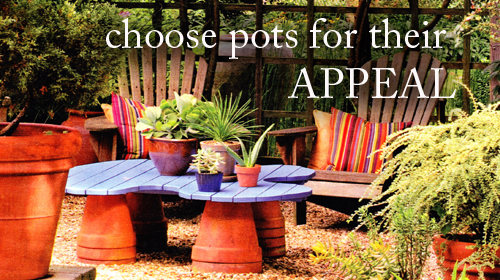 Choose Pots for their Appeal. At the most basic level, all containers allow us to plant where there is no earth. Terraces, patio's, buildings or balconies. 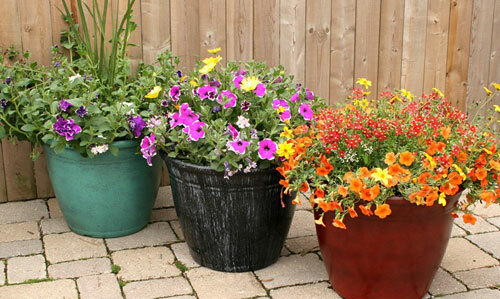 But container's also add decorative accents to gardens. Used like sculptures, they can give focus to a setting. They also bring the beauty of plants closer, making it more accessible to the city dweller or the elderly. 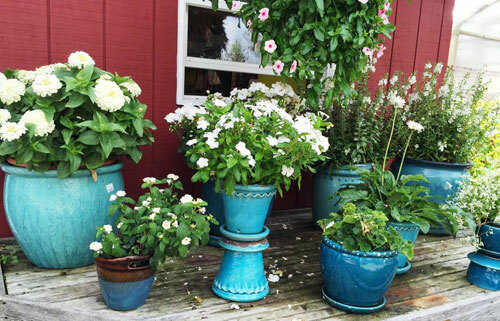 Terracotta is one of the best materials for containers because it is porous, letting roots breathe. It's drawback is the breakability It's looks improve with age, gaining a greenish mossy tint. High fired clay pottery is fairly durable. Italian pottery is low fired but very compact with a nice warm color tone. Mexican clay is rough with a thick texture and heavy weight. Water will seep into it's pores, causing it to break down rapidly. We do not carry much Mexican because of this reason. 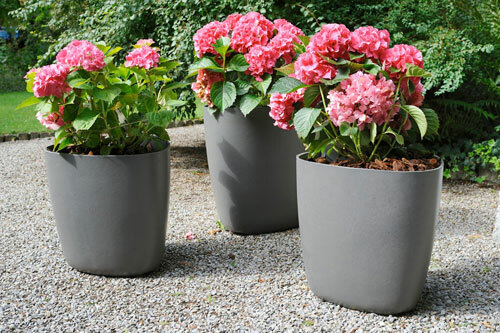 Since pots always seem to shrink in the space between the stores shelf and the outdoor site - it is best to go a size larger than you think you need. 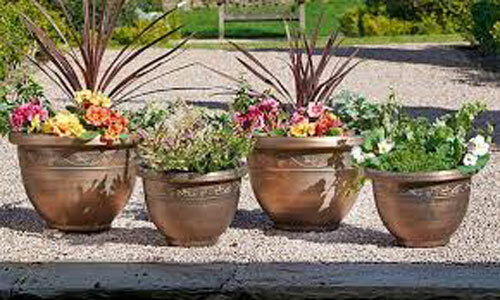 A well chosen pot will enhance your entry, patio or grotto for years. Try to consider the architecture of your home, especially the details. These are the clues that link the home to the garden. Whether your garden is a formal planting of ivy and evergreens, or an electric mix of plant materials, the right container will enhance your style. Subtle or eye catching containers will give you dimension and personality. Make it your own patch of Eden! Read more.....Make a succulent topiary.